If you double the recipe, you can use the leftover sweet potatoes as part of a winter salad with feta cheese and rocket the next day. Preheat the oven to 180°C/gas mark 4. 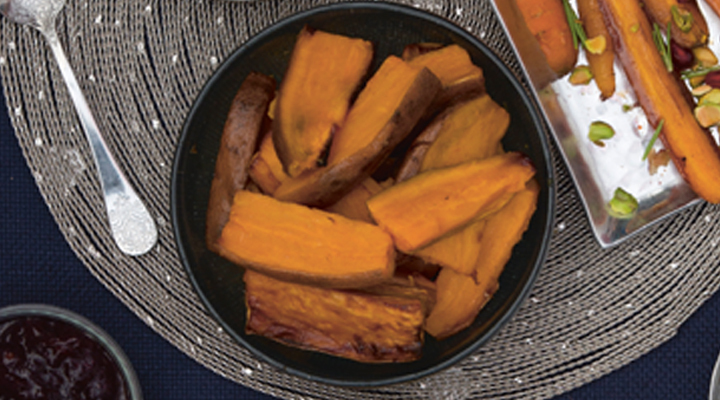 Cut the sweet potatoes lengthwise into wedges, removing any gnarly bits on the skin. We always leave the skin on as there is lots of nutrition and fibre in the skin. Put the wedges in a large mixing bowl. Put all the other ingredients in a blender and blend until smooth. Pour the sauce on top of the sweet potato wedges and mix well. Transfer the sweet potatoes to a baking tray and spread them out evenly. Bake in the oven for 30 minutes, until they are crispy on the outside, soft on the inside and an all-round taste sensation!